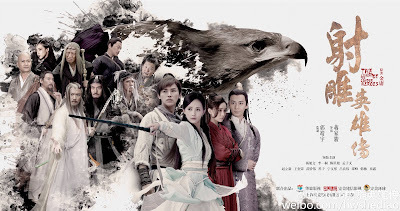 The Legend of Condor Heroes 2017 is on-air now on Dragon TV, Dong Fang TV and iQIYI. I’ve been watching ep 1-4 from Monday to Tuesday this week, and I am glad to say that it’s a promising series. Click this link for the iQIYI viewing. Although there are so many YouTube channels uploading the drama now, please view it at iQIYI If possible, for it might help the rating. The followings are my commentaries on episodes 1-4. I won’t go through the minute details of the episodes; there are other blogs available surely that mention the episode details. 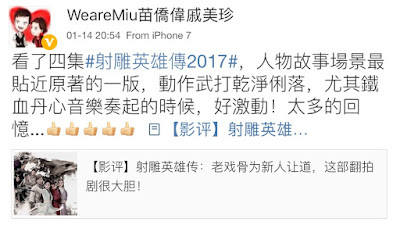 I will definitely go into detail when my favourite Michael Miu appear, but he might not appear before early or mid-February. But we know that Michael is happy with the series so far (see his Weibo at the end of this article). 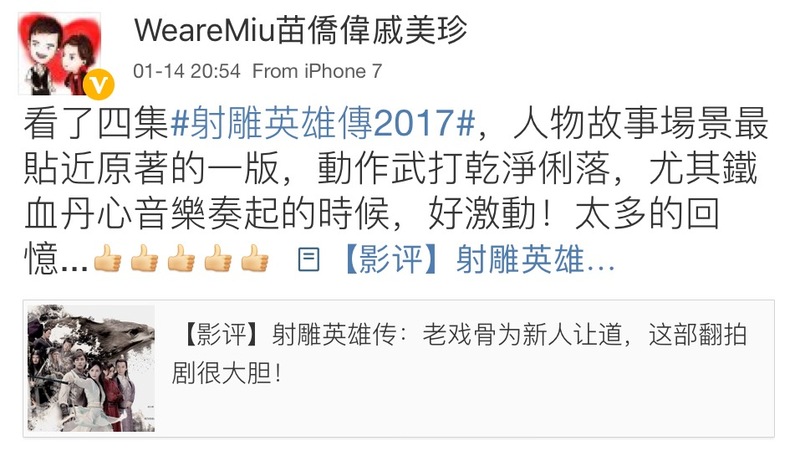 Also at the end of the post, I have a very nice snippet of the upcoming performance by Michael and Felix Wong, singing 'You're the Best in the World' for the upcoming Spring Festival at Jiangsu TV. Thanks to A Virtual Voyage for the news! This episode covers about one minute of the life of the Yang and Guo couples before the arrival of Qiu Chuji. Then after Master Qiu arrived at the Ox Village, things escalated to include the destruction of the Yang and Guo families because of Wanyan Honglie. We also saw the sad demise of Guo Xiaotian (Guo Jing’s dad) and Yang Tiexin falling off the cliff when he tried to rescue Li Ping (GJ’s mum). Then we saw WYHL pretending to rescue Bao Xiruo (Yang Kang’s mum), and the first scene of the Seven Freaks of Jiang-Nan. The episode ended with BXR trying to kill WYHL for she just realised he was a Jin, but she then decided to abort that plan and live for her baby inside her. Love the instrumentals used when WYHL told BXR that her husband died. That instrumental music should be used in the ending theme, or at least alternating with the current one (which is the extended version of the instrumental of ‘Iron Blood, Loyal Heart’). Like it how they made WYHL chasing BXR with horse. That was a nice poetic licence to him ‘saving’ her. And the way Second Freak Zhu Cong stole WYHL’s money was classic. Love it. Chor Lau Heung would be more subtle, but hey, Jin Chenmu (Zhu Cong’s actor) was good looking with his stubbled chin, so I have no complain… WYHL (Zhong Fengyang) was too pretty though for a Jurchen Prince; I’m glad that he later ditched the Han hair style (which made him looking too pretty) and donned a mustache and the proper Jin hat instead. This episode mostly covers the misunderstanding between the Seven Freaks and Master Qiu Chuji, Duan Tiande’s successful plan in making the masters fight against each other, and Li Ping’s subsequent adventure in Mongolia. Love that Li Ping rescued Qiu Chuji from Duan Tiande’s sword. This woman is definitely tough cookie! But I don’t understand how she escaped Duan Tiande and ended up pushing the carts in the snow blizzard. Why did Duan Tiande make her a capture, why didn’t he just kill her? The scene where Li Ping gave birth to Guo Jing in the snow was touching. The way Li Ping and baby Guo Jing were saved by the passing Mongolians was touching. Jebe the Archer was amazing. The scene where little GJ first met Jebe was handled very well. When someone shot an arrow at Jebe, Jebe actually leaned backwards on his horseback. That was a very neat move! I've never seen Jebe described in such a cool way. I always know that he's cool, but watching him doing cool things is interesting. This episode covers GJ’s childhood in Mongolia and how he met the Seven Freaks (well, Six Freaks) and Mei Chaofeng. GJ also met Master Ma Yu, who later in Ep 4 told him how to properly breathe (and sleep). I like William Yang's Guo Jing. His 'stupidity' and naiveté are believable. Of course, my new favourite Jebe and Genghis Khan are also a delight to see, even they just sat on the horse backs and laughed. Very cool. The Mei Chaofeng vs Seven Freaks scene was well-shot, though they still used extensive wire-fu and too many slow-mo for my taste. I felt almost sorry for MCF when her husband died stabbed by the little GJ. Well, it’s his fault anyway, who told him to be cruel to kids?! And I have to say, the music composer did a great job with the instrumental pieces. They fit the storylines; the drums and the flutes invoke a Rurouni Kenshin samurai feeling, which is great, I think. I hold the Rurouni Kenshin Trilogy in high regard in terms of Asian period action series, and I think the Kenshin OSTs truly fit the storyline. Using drums and flutes (in addition to zither) for a wuxia series is commendable. This episode covers the Seven Freak’s idiocy when they thought GJ was trained by Mei Chaofeng, although it was Master Ma Yu who trained GJ on the proper breathing techniques. The ep also covers the rivalry and enmities between Genghis Khan and his anda (brother) Jamukha. The Genghis Khan vs Jamukha & WYHL battle was the highlight of the episode for me. GJ came out quite impressive after my so-so opinion about his eagle shooting scene. Most impressive was the last bit when he fought Jamukha’s men; and the bit where GJ side-stepped a whip and delivered a jab at the jaw with his palm from below. That was very neat! In 1983, I was only interested in the storyline during the Yang-Guo tragedy and after Barbara Yung's Wong Yung arrived, cos it was like 7 episodes in between; but the pace in this series is quite fast without skipping GJ's important childhood (unlike the 2008 ver). So far, I like it. 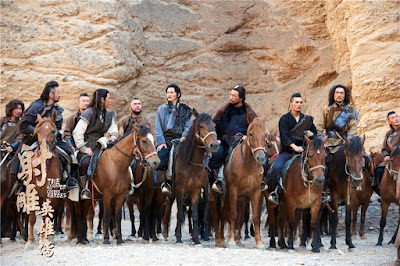 I might be a bit sorry later when the 6 Freaks and GJ left Mongolia for Jiang Nan... my fave so far are Jebe, Genghis Khan, and Second Freak Zhu Cong. I like GJ too, but I'll wait till ep 5 to say he's my favourite (I hope so...). And! If you wonder how the first meeting of GJ and HR will be, check this link. For the first (of the oh so many) fight between GJ and YK (Chen Xing Xu), check this link. CXX looks good as Yang Kang so far, I like his grin, bordering mischievous and mean, when he fought GJ. This link is to view the fight between GJ, Master Wang Chuji and YK’s minions. Well Michael, I'm so looking forward for your (and Felix') singing, and for your action in Feb! Btw, Michael Miu has a good voice actually. Deep and rich. I'm fine that he's not a singer, but I love listening to his voice...including his singing... (an MV of him and Barbara singing is TBA). So far eps. 1 & 2 exceeded my expectations. I love LOCH, I love the story and have always loved it. And of course I love the 83' version most. I had opened my heart to the 2008 version, and next thing you know there is a 2017 version which brings us to now...which I LOVE that Michael is in by the way, and looking as FINE as ever. The updated hairstyles and outfits are really eye appealing I must say. Like you, I really like the way Jebe and Genghis Khan look. Im slowly getting use to Guo Jing. I enjoyed the extra depth of strength that Li Ping showed in this version. Bao Xiruo is very beautiful and I love her adorable look. Kathy Chow in the 2008 version was very beautiful and cute too. Love their looks. So far so good. Again I liked it more than I thought I would. Hannah, thanks a lot for your comments! Yes, I am very happy that the episodes so far have been good. Some of them great, and I think ep 1 was really good in setting up the tone, with the use of Iron Blood instrumentals during the chasing scene. Totally love Jebe and Genghis Khan here! And yes, I was afraid that Li Ping will be too beautiful, but she can still pull a tough woman look despite being pretty in the savannah. I actually CANNOT wait to see Michael in action, but I'm happy that the episodes beforehand are very good as well.